Gliding is a form of flying that is ideally suited to those with disabilities or who have limited mobility. The medical requirements for flying solo are the same as those for driving a car. Gliding is probably the purest form of flying and it’s one of the cheapest as well! 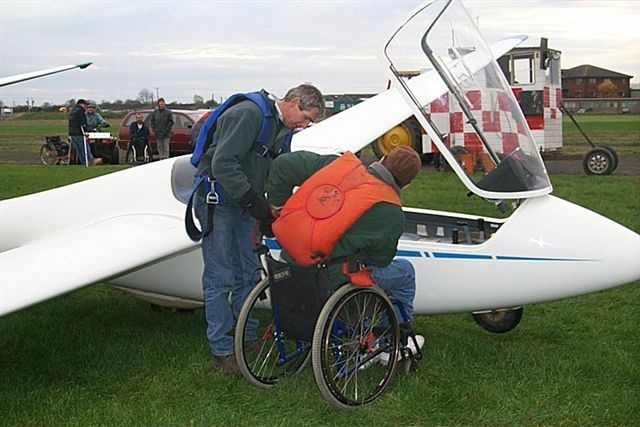 A number of clubs have two seater gliders that have been specially adapted for hands-only operation and, once in the air, disabled pilots can fly (and compete – gliding is a competitive sport) on a level playing field with able bodied pilots. The pilot who came second in the 2015 European Gliding Championships is confined to a wheelchair when not flying. His JS1 racing glider included modified controls. Gliding can give disabled people a new dimension to their lives opening up freedoms in the air that may only be dreams on the ground. Read about what gliding has done for one pilot, Steve Derwin, on the English Federation of Disability Sport blog. Hands-only pilots will need well co-ordinated and reasonably strong arms if they wish to take full control of the aircraft. But that doesn’t of course mean that those with little or no strength in their hands cannot enjoy the challenge of flight along with a safety pilot. We aim to keep this list up to date but please check with individual clubs for full details and availability. Many deaf people have become glider pilots. There is a web site specifically for deaf pilots and potential pilots which provides information and showcases achievements.